Wine, charity and fun converge for the ultimate wine week in Northwest Florida, April 23-26, 2015, as the South Walton Beaches Wine & Food Festival and Destin Charity Wine Auction Foundation (DCWAF) come together to host some of the preeminent winemakers from around the world. Complemented by the area’s sugar white sand beaches, the week of wine includes wine tastings, wine dinners, craft beer and spirits night, culinary seminars, live entertainment by Nashville songwriters and the Destin Charity Wine Auction. Coinciding with the festival, Newman-Dailey Resort Properties is offering a 10% discount on stays of three-nights or more in any South Walton vacation rental, including Hidden Dunes Beach & Tennis Resort located near the event site. The Destin Charity Wine Auction recently ranked among the nation’s top four most successful charity auctions in the country by Wine Spectator Magazine. Founded in 2005, DCWAF is celebrating its 10th anniversary this year and has donated more than $8 million to support a variety of children’s charities in Northwest Florida over the last decade. In addition, proceeds from the South Walton Beaches Wine & Food Festival benefits DCWAF and its 12 charity partners. DCWAF and the South Walton Beaches Food & Wine Festival are honored to welcome fifth generation wine pioneer Marc Perrin of Château de Beaucastel as the honorary international vintner. The legendary Château de Beaucastel dates back to 1909 and their recent partnership with Miraval Estate owned by Hollywood stars Brad Pitt and Angelina Jolie has placed the Perrin family back in the limelight. In addition, dashing French winemaker Jean-Charles Boisset will join the dazzling roster of nearly a dozen celebrity winemakers. Boisset represents 12 wineries throughout several regions of France and seven in Napa Valley and the Sonoma region of California. Boisset’s passion and commitment for quality fine wines has led this innovative winemaker to implement organic and Biodynamic farming at all of the family’s estate vineyards in both Burgundy and California. The weekend also includes a variety of South Walton Wine & Food Festival events. On Friday night, a "Winemakers and Shakers" special meet and greet will allow guests to interact with some of the most respected winemakers and acclaimed chefs. Later that evening, Craft Beer & Spirits Jam that will feature hottest breweries and distilleries in the country along with a live performance by Boukou Groove. Saturday begins with a South Walton Beaches Wine & Food Festival VIP tasting featuring exclusive vintners and rare varietals, followed by the Grand Tasting, featuring more than 800 wines, and culinary seminars. Held simultaneously, the Destin Charity Wine Auction will begin at 2 p.m. on Saturday, featuring nearly 200 silent and live offerings, including exotic trips and rare wines. Twelve Patron Dinners will also be hosted in private homes throughout South Walton and Destin, Fla., featuring a premier winemaker and celebrated chef at each residence. A limited number of tickets are still available for the patron dinners. Located just a two miles west of Grand Boulevard, Hidden Dunes Beach & Tennis Resort features gulf-front condos as well as cottages and villas that are tucked away amid the lush landscape, providing a quiet oasis after a day of wine tasting. The 27-acre resort overlooks the white sand beaches and includes two pools, hot tubs, natural gas grills, and Rubico Clay tennis courts. 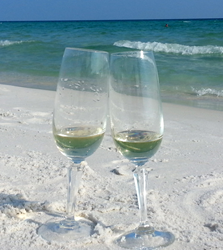 Newman-Dailey’s South Walton Beaches Food & Wine Festival special offer*, includes a discount of 10% off stays of three-nights or more in a South Walton vacation rental, including rentals on Scenic Highway 30A as well as rentals in Sandestin and Miramar Beach, Florida from April 18 to May 2, 2015. To view available beach vacation rentals, visit http://www.SouthWaltonVacation.com or call 1-800-225-7652. To purchase festival tickets, visit http://www.SoWalWine.com. *Some restrictions apply. Cannot be combined with any offer or used with long-term stays. Newman-Dailey Resort Properties is a locally-owned business, specializing in resort rentals, sales and management in Destin and South Walton for 30 years. Recognized for excellence, integrity and professionalism, Newman-Dailey consistently receives the “Certificate of Excellence” on TripAdvisor, and the Real Estate Division is consistently listed among the top 10 percent of real estate companies along the Emerald Coast for sales. For more sales or rental information, call 850.837.1071, or visit online at DestinSales.com or DestinVacation.com.